Click the button below to add the Blue vintage style soft cotton shawl / scarf to your wish list. This colourful vintage style scarf/shawl makes a perfect statement piece for any outfit. 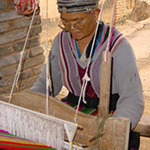 Ethnic minority communities living in rural areas make up the poorest sector of the Lao population. Recognising the unique obligations of a museum working with these communities, the Traditional Arts & Ethnology Centre (TAEC) runs an innovative livelihoods development program based on traditional handicraft skills. The overwhelming majority of handicraft producers in the program are ethnic minority women, who studies have shown spend their income on their family’s food, health and education needs. TAEC is certified by Fair Trade Laos.